Before we get into the DVD wars to come, let’s revisit what came before. Then came JVC with its VHS format and longer playing time. And although it didn’t provide quite the same quality as Sony’s Beta, it gave longer recording time, so a 2 hour TV movie could be captured and played back on one tape.. So VHS won the hearts and dollars of the viewing public. Thus BETTER quality, failed and LONGER play time won! More recently came the battle of the DVD recording formats, with “Plus” and “Minus” persuasions. (Actually the "Plus" and "Minus" designations were brought on by the newer kid on the block -- the "Plus" group to indicate their "superiority" to the "Minus" group. Even though there is not much serious difference between the two under MOST usage circumstances. So here -- we will eliminate the pejorative ”Minus” and refer to it from now on as "Dash" to differentiate from the "other" (Plus) group, And we’ll refer to it as "DASH-R AND DASH-RW" to lower the decibel levels created by some of the Plus, marketing folks). The Dash (read “-“) format was off the blocks first. And it worked quite well with some limitations as an editing medium. And the first re-writeable iterations "seemed" to require a lengthy (as much as an hour) PRE-formatting before use and the inability to record and erase randomly for editing. This, however was actually a common MIS-conception with DVD-RW. Pre-formatting is not necessarily required as the media could be formatted on the fly. But though this mis-conception was fodder for the "Plus" group’s marketing cannons -- it made little difference. Why? Because most users neither cared nor would have been bothered, since about 90% of the recordings are made using write ONCE media. And only about 10% were using the re-writable formats, Write-once (DVD-R) formats do NOT require formatting at all. Thus these two opposing camps and formats shared more positive similarities than negative differences. But those Promotional talking points, coupled with the fact that Dash could not be universally played on ALL then current DVD home players and because the first Dash recorders and media were only designed to record at 1X (normal playback) speed, meant a two hour show took two hours to record AFTER the pre-formatting IF it were an RW disk. With a write-once disk, which required NO pre-formatting -- the 1X recording limitations were actually a function of the limitations of the reading and writing technologies in the beginning stages of this marvelous recording technology. But, these perceived mechanical and media "limitations” left the door open for a competitive “improved” approach designed to eliminate these pioneering low cost optical device characteristics. Though some may consider the "improved” approach of the "Plus" group largely (but certainly not entirely) marketing hype, its competitive introduction rapidly advanced the capabilities and speed of BOTH systems. The Plus method for DVD recording and playback system was pioneered by Philips, Ricoh, HP, Thompson, and other “heavy hitters”, while Sony supported Dash systems in many of their consumer devices. It pays to remember that "DASH" had a strong early start and worked very well for its time. But the "Plus" camp claimed to permit playability on a slightly larger percentage of the older (let’s call them “legacy) TV-top players and the fact that its recording hardware and media speed started out at 2.4 times faster than that of the original 1X Dash recorders. In addition, the +RW re-writeable disks, required only a few minutes pre-recording set-up time. So its more than two times recording speed advantage and quick start helped it get off the ground despite the fact that the “Dash” units had a few years marketing advantage. And though it seemed that the Plus group was the first to provide faster than 1X recording speeds, when they first arrived on the market, it must be noted that Pioneer had already introduced their 2X DVR-A03 recorder and media in 2001 -- BEFORE the +RW machines shipped from Philips, HP, Ricoh and Thompson. And while the Plus system used a similar physical sized disk, it provided a new type of precise positioning indicators throughout the disk, which they felt permitted much more latitude in writing and editing, whether video or computer data. It consisted of a High frequency “Wobble Grove,” while the Dash formats use a “land prepit” scheme permitting BOTH formats to have a similar, if not exactly the same degree of address precision. And while the RE-writable Dash disk had to be completely erased before RE-writing, the Plus disks could be RE-written without wasting reformatting time and losing all the material on it. To be fair, the Dash Re-writeable disk can be "quick formatted' in about two minutes -- but that destroyed all the information on it. Please note that the following numbers and percentages are arguable and were provided by the participants and competitors in each side. The “Dash” side claimed compatibility with about 80% of the legacy players and the “Plus” folks claimed that “Dash” was playable on only about 70%. The Plus folks also claimed that “Plus” disks were compatible with “up to "90%" of the existing DVD players. But, it was and is a matter of testing on your own equipment to see if it works with one or the other, because sometimes the Dash disks were readable where the Plus disks were not and vice versa. And, both the Dash and the Plus sides claimed a slight edge in compatibility. After the initial introduction of the “Plus” format," things changed -- FAST! The “Dash” group advertised their highest recording speed 2X, then boosted it to 4X and more. While the “Plus” group upped theirs faster than 16X as we write this, while still retaining the ability to selectively RE-write their re-writeable disk line. Fortunately this is all in the history books. Compatibility ratios depend a great deal on how one defines “compatibility”— does this mean ability to spin up, or does it mean play through an entire disc without any hiccups? The good news is it doesn’t matter much because almost every player shipped for the past couple of years onward will play either camp’s discs equally well. Sony rocketed out with a DUAL format DVD burner, forever changing the landscape. SONY -- always perceived as a premier manufacturer, COMBINED the two standards into ONE burner, obliterating much of the competition. At that point users could buy whichever type of disc they wanted, or which were the most compatible with their DVD players, or which were cheaper! So the consumers won because Sony’s clever move forced ALL DVD Burner manufactures to offer Dual format systems. With trivial differences in the price of the single or dual format machines, who, in his or her right mind would buy the single medium machine? Apparently NO ONE! SO DUAL RULES! Philips, a particularly competent and innovative large company, combined the “DOUBLE LAYER” technology used in manufacturing the kind of play-only disks made for marketing of motion pictures, with their writeable and re-writeable players. They and their very high class consortium of giant companies (including Sony, HP, Ricoh, Thompson and more) -- created a line of Double Layer burnable and Re-Writeable disks that were Planned to be readable on virtually all current home DVD players.. In other words, they designed within the capabilities of the now-selling home players to virtually DOUBLE the capacity of burnable DVD disks. This means that they could now record about 8.5 GB on a single sided disk, although this media, selling at more than three times the price of a single layer disk. As the late night TV Commercials say: “But that’s not all!” These new burners played and burned virtually ALL the current disk types and at the latest speeds! They are virtually all able to write CD-Rs, CD-RWs, DVD Plus and Dash Rs AND Plus and Dash RWs. Even better for consumers, if not manufacturers, the prices of these devices have PLUMMETED! With ads this week, for Double Layer machines from Sony, Toshiba and the excellent ones from Pioneer and Plextor, at the highest current speeds, are selling close (above/below) $50. Who could resist? Not I! The big bad Blue Lasers have now attacked the winners of the DVD battles. Another War of the Recorder Worlds has already begun, even before the dead bodies of the Plus vs. Dash -- combined with Double Layer soldiers, are dragged from the battle field of Optical Storage. But this war is not being fought with flying disk shaped UFOs, but with real optical storage discs for your own computers and set-top DVD players. Once again there are TWO flavors of technology ready to duke it out in the market place. Their opening salvos have already been shot across the bows of the movie studios that will NEED the kind of storage density that either or both camps can provide in the short term -- for the burgeoning HUGE market for MONSTER screen HD TVs and the HD players needed to store and play the new class of videos – already being delivered – at no increase in cost – by Netflix. (Keep “short term” in mind.) It is clearly a replay of the Sony Beta vs. JVC VHS format wars. And this time the two sides are named: Blu-Ray (also called BD) vs. HD-DVD. There are great similarities and some serious, serious, differences. Note the two “seriouses.” Between the "Blu-Ray (BD) and "HD DVD discs." First off -- They BOTH use burning and playing technologies that (more or less) EXIST TODAY, but with different takes on disc construction and burner production and manufacture. Second -- Both use blue/violet lasers of 405 Nm (nanometer) wavelength. This, alone, permits AT LEAST 2.6 times the data density over a current DVD’s RED laser of 620 Nm. But there are further differences explained below. The numbers indicate smaller wavelength, which equals closer packing of smaller data dots (bits), which translates into an INSTANT advantage in data storage of video or other information. Third -- They are BOTH capable of recording a full length HDTV film in exquisite quality, plus many of the “normal” add-ons of DVD merchandising, like commentaries and behind-the-scene looks, multiple languages and camera angles and more. Their differences result from their two approaches to technology. The HD DVD school -- wants to build burners and discs that they can reproduce by the millions using only slightly modified current disc stamping equipment, even if this means that they can’t produce the same capacity or bit rate as Blu-Ray discs. This also means that the DVD PIRATES will be able to continue their piracy without having to shift (BUY$$$) costly, new equipment. Good for the thieves but bad for the studio originators who spend millions PRODUCING, not COPYING original work. At this point HD DVD’s maximum storage is 15 GB on a single layer disc and about 30 GB on a double layer disc. But the Blu-Ray folks have already advanced to the next stage of optical recording technology. This provides much greater storage -- 25 GB on a single layer disc and 50 GB on a double layer disc, meaning that they’re STARTING OUT with a full 40% greater storage than HD DVD. It also means that they bypassed the older, perhaps obsolete, technology of their HD DVD competitors. Also, even though the fight for deliverables has hardly begun, the Bu-Ray camp can already provide 166% more bang for the buck related to Replicated discs (the kind we buy in the store). And even when the HD-DVD side is doing double layer recording -- this means an approximate additional 166% advantage of the Blu-Ray discs for recording. WHICH BLUE FLAVOR TO CHOOSE -- WHICH WILL WIN? Or, because I often have need to drive a truck or a van, if someone offered to sell me a truck that carried more than half again as much as another truck -- at the same price and if this stronger, higher capacity truck were the same physical size and weight, got better gas mileage AND WENT FASTER -- would I need to be Einstein, to figure out which to choose? I think not!! 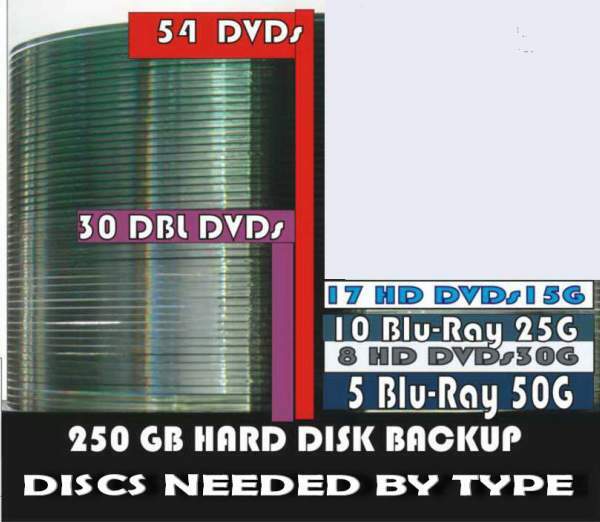 While it is clear that, compared to current red laser DVDS, Blu-Ray and HD DVD are both desirable choices for our entertainment and data storage -- doesn’t it seem strange that one is already an advanced technology and the other is, at the moment, not even state of the art? And while HD DVD may have enough recording density for many, if not most, of today’s HD Video titles, it is clearly NOT the right choice for our growing archival computer data needs. Copyright(c) 2011 NetSurferNews. All rights reserved.